Roaches vary in color from a brown to black in the house-invading species, but the tropical species can be green, orange, and other colors. These nasty pests can grow up to 1.5 inches in length, and prefer warm, moist, and dark areas. They have an oval shaped and are flat-bodied, with a pronotum, or shield-like covering, which projects over their head. Both the male and female are fully winged. Although they are able to fly short distances, they seldom do, preferring to let their six long legs do the scurrying when making a run for cover, which anyone who has surprised one feeding knows. Females produce their skittering spawn from purse-shaped egg capsules, which are formed at a rate of about one per week until 15-90 have been produced. Each capsule contains 14-16 eggs, which produce grayish-brown nymphs. These nymphs quickly begin feeding, and although their appearance and behavior is similar to the adults, they are smaller and don’t have wings. 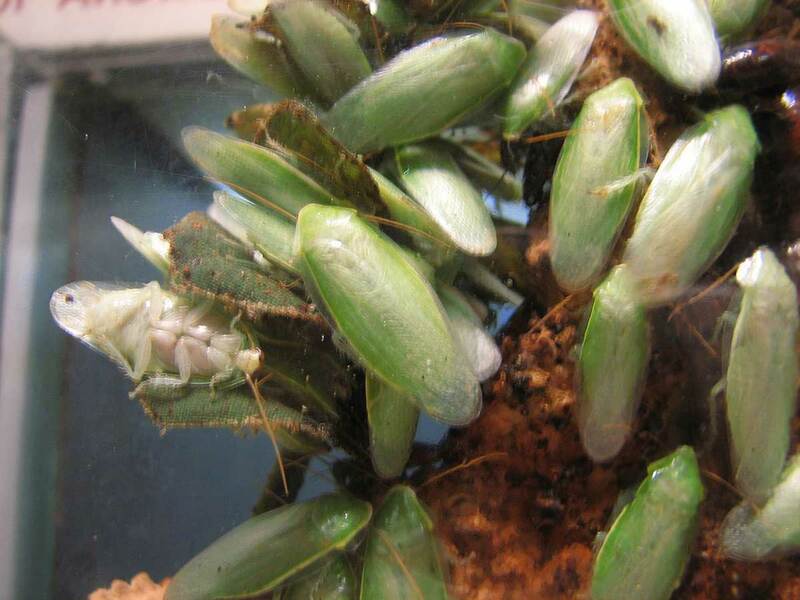 Newly molted nymphs are white, but darken to their normal color within a few hours. Although cockroaches can be found in groups in their daytime hiding areas, known as harborages, or feeding in groups at night, cockroaches are generally not social insects as ants or wasps are. They tend to behave in an individual or non-social manner, but often form small clusters. Cockroaches aren’t picky eaters, though they tend to favor decaying matter, and have been known to snack on sweet, starchy and greasy foods. As scavengers, the cockroach is an opportunistic and omnivorous feeder. They have been known to eat just about anything: paper, boots, pet food, book bindings, cloth, leather, glue, and even other roaches. Most Floridians are familiar with the American roach, which is the largest pest species of cockroach. They are reddish-brown with light brown markings around and behind its head, as well as two dark spots on the pronotum that look like eyes. 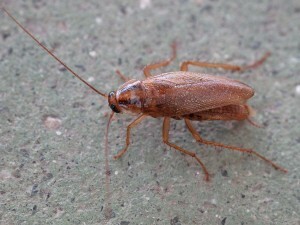 Other cockroach species, such as the Florida Woods roach, Smoky Brown roach, Brown Banded roach, Australian roach, German roach and Asian roaches are common in Florida as well. Do you live in Florida and have a roach problem in your home or business? HITMAN Termite & Pest Control Environmental Services offers custom designed treatments to control and prevent these pests! 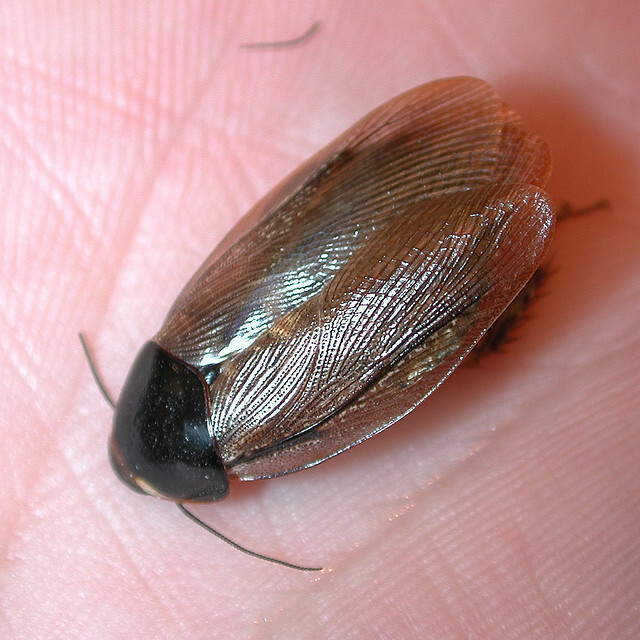 Smoky Brown roaches are mahogany brown to black in color, and have no patterns behind their head. Size 1 ¼-inch in length. Smokey brown cockroaches are good fliers and easily travel from trees on to houses. It is commonly attracted to homes to feed on trash containers and pet food on patios and decks. They are also attracted to light. Smoky Brown roaches are abundant outdoors and are found in tree holes and leaf litter. They are commonly found in the attics of homes. Do you live in Florida and think that this pest may be invading your home? HITMAN Termite & Pest Control Environmental Services offers specialty treatments designed to control and eliminate these pests! The Florida Woods roach is dark reddish-brown to black in color and has a wide glossy body. At first it appears to be wingless, but does have very short wings just beneath its head. Size Ranges from 1 ½ to 2-inches in length. 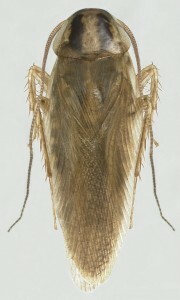 The Florida woods cockroach is often called the “stinking” cockroach because it produces a foul-smelling fluid to protect it from predators. The nymphs have broad yellow bands on the top of their thorax. The average egg-to-adult development is approximately 100 days, and females will produce 21 eggs per egg capsule. Florida Woods roaches are commonly found in leaf litter, mulch, wood piles, and under rotting logs. They prefer damp locations with lots of moisture. It can wander indoors at times, especially into damp locations such as bathrooms. 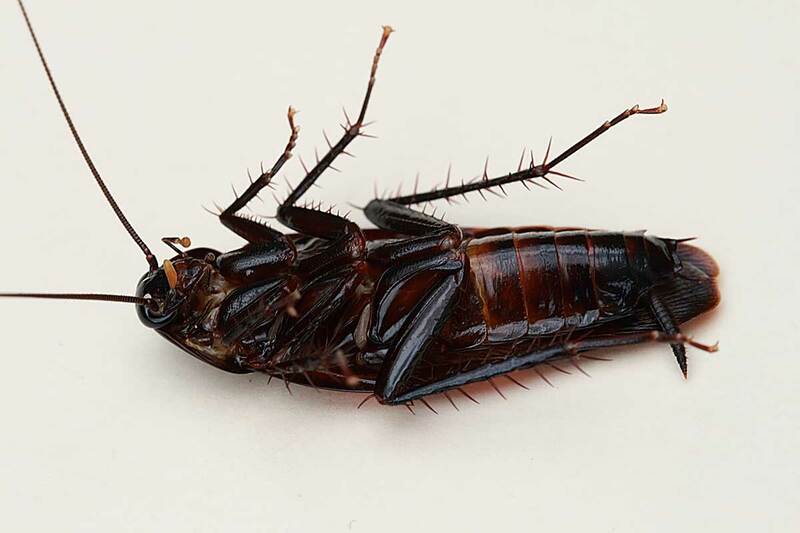 Oriental roaches are often found feeding on garbage, sewage, or decaying organic matter. They will eat almost anything, but they prefer a high starch diet. Oriental cockroaches tend to live near the ground in warm, damp areas. They are more slow-moving than other species and they also give off an unpleasant odor. Oriental cockroaches prefer areas of high humidity and cool temperature. They are commonly found in basements, crawl spaces, and areas between the soil and foundation. They will often enter buildings through sewer pipes. The Oriental roach often inhabits sewers and therefore carries many pathogenic organisms. German roaches are the most widespread of all cockroaches in the United States. They complete their lifecycle in approximately 100 days, and they breed continuously (with many overlapping generations present at any one time). 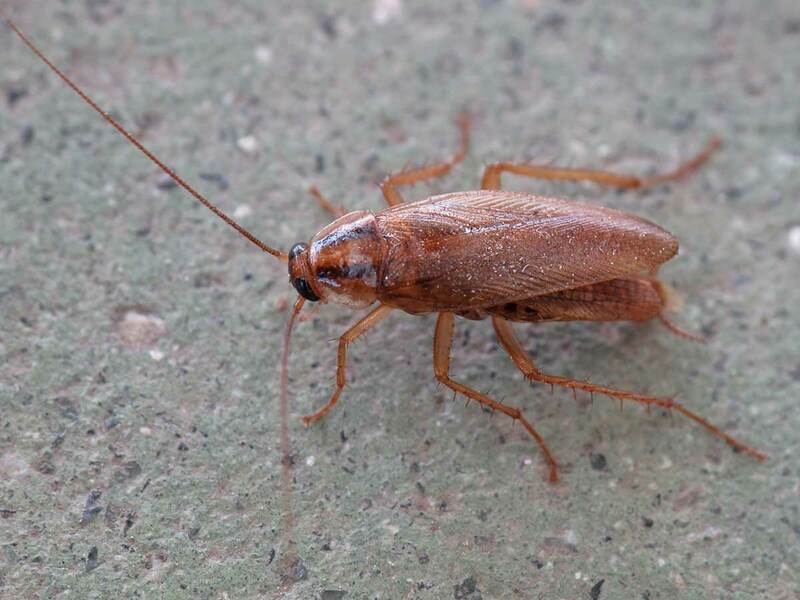 Under ideal conditions, it has been estimated that one female German roach can be the cause of a population explosion of over 1 million more German roaches. German roaches are commonly found in and around apartments, homes, supermarkets, and restaurants. They prefer areas near food, moisture, and warmth. The major factor limiting German cockroaches survival appears to be cold temperatures. Studies have shown that German cockroaches are unable to colonize and survive in homes without central heating in northern climates. However, in the warmer temperatures of Florida this roach flourishes. 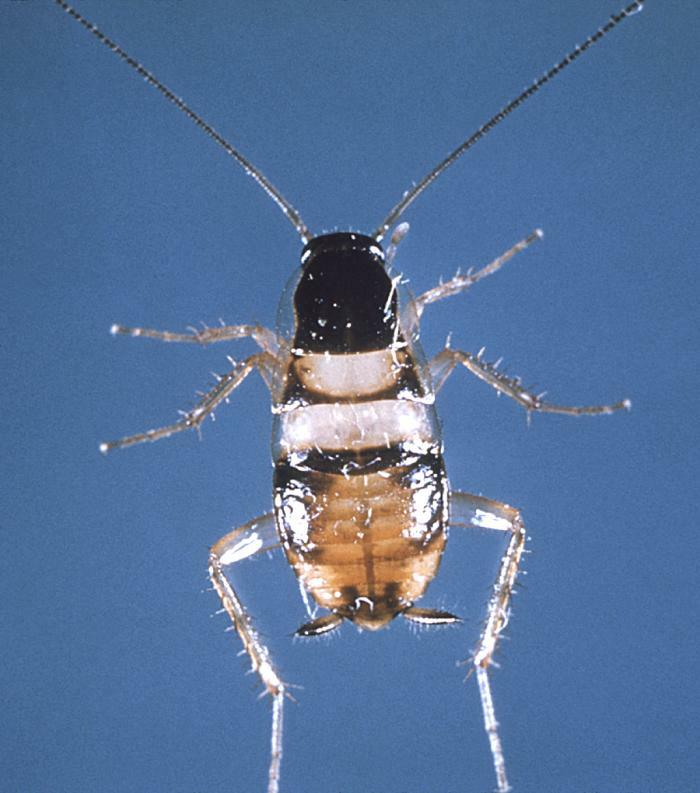 Do you live in Florida and think that this pest may be invading your home? HITMAN Termite & Pest Control offers Environmental Services and treatments designed to control and eliminate this pest! Adults are pale green and nymphs are brown or black. Cuban roaches can grow up to 2-inches in length. The Cuban cockroach, also called the green banana cockroach, is usually an outdoor species. They can be found in shrubbery, trees, and plants. Cuban cockroach adults are green, while the nymphs are dark brown to black. This is because the adults live in the canopies of trees, while the nymphs live on the ground below. Their coloration acts as a camouflage for both nymphs and adults. Do you live in Florida and think that this pest may be invading your home? HITMAN Termite & Pest Control Environmental Services offers specialty treatments designed to control and eliminate these pest. Brown banded roaches are light brown to glossy dark brown in color. There are two pale, transverse stripes on the abdomen of the cockroach. Brownbanded cockroach females deposit egg capsules in clusters on furniture, draperies, wall decorations, shelving, and ceilings. The egg capsule contains 14 to 16 eggs, and a female produces 10 to 20 capsules in her lifetime. They feed on starchy materials, and will even eat non-food items such as nylon stockings. They are nocturnal, and while both cockroaches can jump, only males can fly. Brownbanded roaches prefer to hide in warm, dry areas. They can be found near the ceiling, behind wall decorations and loose wallpaper, in closets, beneath or inside of upholstered furniture, and in electrical appliances, such as refrigerator motor housings. They will be found in completely different areas of the home than the German cockroach. 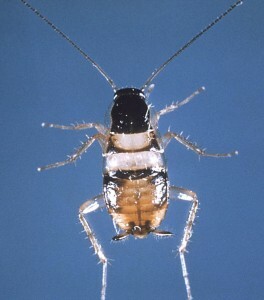 Brownbanded cockroaches can foul food, damage wallpaper and books, eat glue from furniture, and produce an unpleasant odor. Some homeowners are allergic to these roaches also. They carry pathogens that can cause food poisoning, dysentery, and diarrhea. Do you live in Florida and think that this pest may be invading your home? HITMAN Termite & Pest Control Environmental Services offers specialty treatments designed to control and eliminate these pest! Australian roaches are reddish-brown to dark-brown in color. They have a characteristic yellow margin on the thorax and yellow stripes on the wings. Range from 1 1/4 to 1 3/8 inches in length. Behavior Australian cockroaches complete their life cycle in about a year (from egg to adult). Females can produce between 20 to 30 egg capsules, which often will contain about 16 viable eggs. Australian roaches prefer to live outdoors around the perimeter of houses. 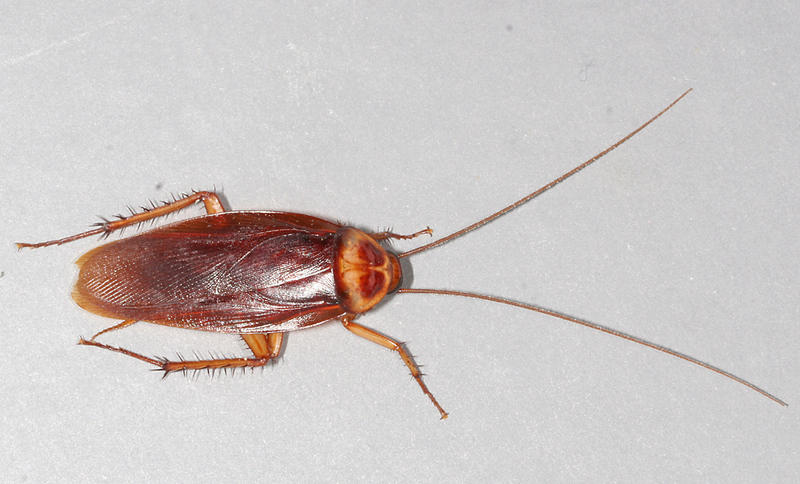 They are the most prevalent cockroach outdoors in South Florida. Australian cockroaches are commonly found in: leaf litter, flowers, trees, tree holes, wood piles, garages, crawl spaces, attics, green houses, and in and around shrubs. Once inside your home, Australian cockroaches often eat clothing, creating holes, and also feed upon book covers. Outside, Australian roach feeds on plants and can be very damaging to greenhouses, atriums, and yards. 1 ½- inches in length. This is the largest of the periodomestic cockroaches. Although these are outdoor roaches, they will migrate inside by crawling or flying into structures. They can also enter through the plumbing. Trees or shrubs located alongside buildings, or trees with branches overhanging roofs facilitate the entry of this roach into the home. The life cycle of the American roach averages about 600 days, and each adult female can produce approximately 150 offspring in her lifetime. Both males and females can fly. The American roach is omnivorous, and will eat almost anything. It prefers sweets and has been observed eating paper, boots, hair, bread, fruit, and other dead insects and beer. The American cockroach is often found residing indoors as well as outdoors. It is found mainly in basements, sewers, steam tunnels, and drainage systems. They are also found in moist shady areas outdoors, in yards, hollow trees, wood piles, and mulch. Occasionally American roaches are seen under roof shingles and in attics. 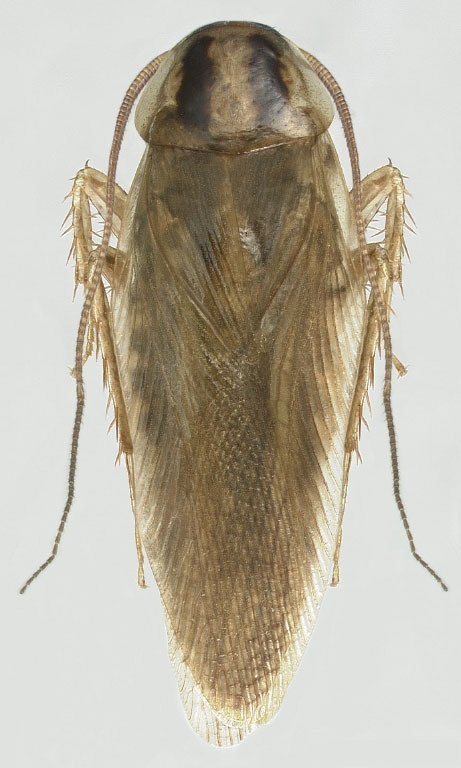 American cockroaches can become a public health concern due to their association with human waste and disease and their ability to move from sewers into homes and commercial establishments. At least 22 species of pathogenic human bacteria, virus, fungi, and protozoans, as well as five species of helminthic worms, have been associated with the American cockroach. 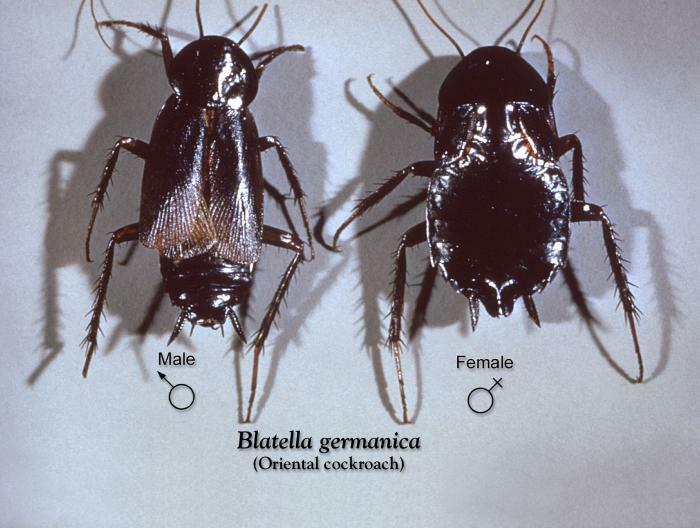 Asian roaches are almost identical in appearance to German roaches. 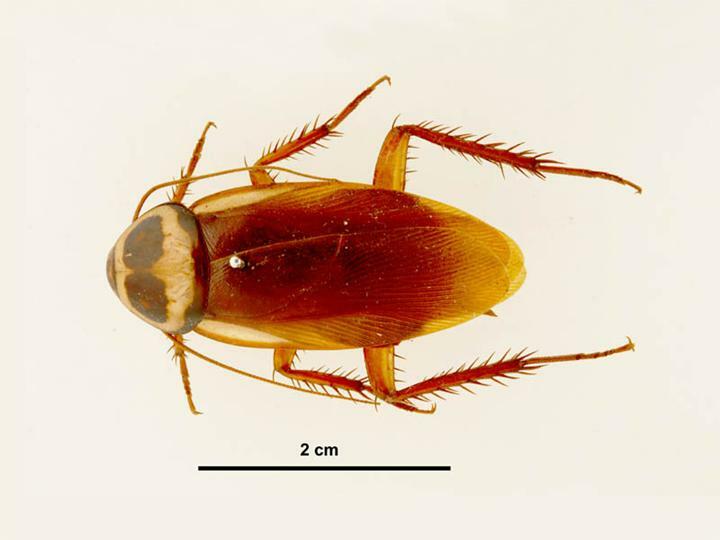 The main differences between the Asian and German cockroaches are: The wings of the Asian cockroach are usually longer and narrower than those of the German cockroach and Asian cockroaches are lighter in color than most German cockroaches. Ranges from ½-inch to 5/8-inch in length. Asian cockroaches are strong fliers, Adults take flight even during the day if disturbed, and are easily seen in infested lawns (because their flight is similar to that of moths and leafhoppers). At dusk it is common to see a flurry of Asian roach activity. Asian roaches are abundant in shaded areas with leaf litter or where there is ground cover, the Asian cockroach is found in shaded areas of pastures, along shaded road sides in leaf mulch, in shaded areas of thick grass, and in ground cover of abandoned citrus groves. The adults have been found feeding on the honeydew from aphids and on flowers during the night. The Asian cockroach is a rural and suburban pest, and will infest both homes and yards. It is abundant outdoors, where populations of 30,000 to 250,000 per acre have been found. Do you live in Florida and think that this pest may be invading your home? HITMAN’S Environmental Services offers specialty Pest Control treatments designed to control and eliminate these pest! Surinam roaches are shiny brown to black in color. These are also called Bi-Colored roaches because the head, thorax and body are black, while the wings are a light brown. The female Surinam cockroach retains the egg capsule within the abdomen, and gives birth to live young. Males are not necessary to reproduce. Surinam roaches are found primarily in Florida, Texas, Louisiana, and in humid tropical climates. They are burrowing insects that are capable of destroying various plants. Surinam cockroaches are often unknowingly brought into homes, shopping malls, and restaurants in potted plants. Surinam roaches are plant feeders. They can severely damage plants in greenhouses, atriums, and yards. Do you live in Florida and think that this pest may be invading your home? HITMAN Termite & Pest Control Environmental Services offers specialty treatments designed to control and eliminate this pest!